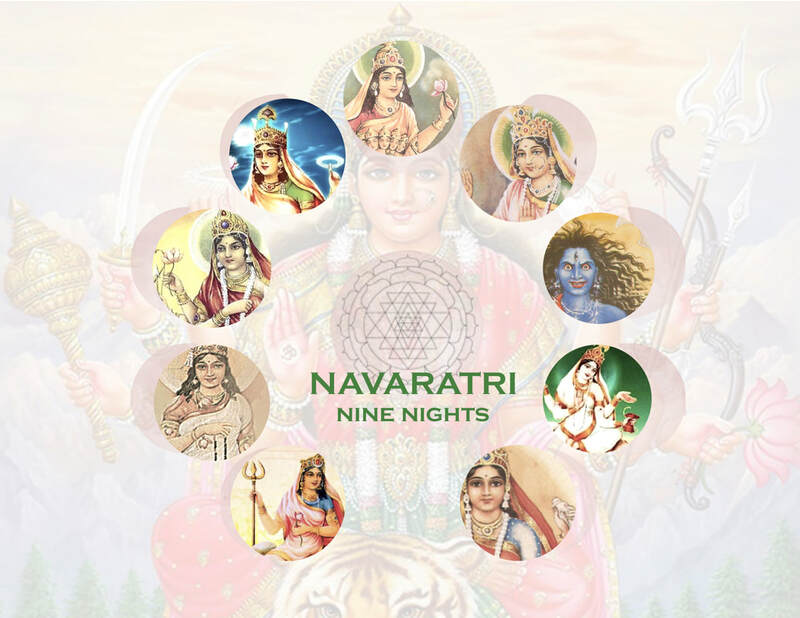 ​divine part of yourself and open to something new"
Chaitra Navratri (also called Vasanta Navratri) is a nine-day festival dedicated to nine forms of the Goddess. Most celebrated in Northern and Western India, this festival celebrates Spring and the creative power of the feminine principle. For those who follow the Luni-Solar calendar, this holiday marks the beginning of the Indian new year. Celebrations extend from the new moon until the ninth day of the Shukla Paksha (waxing moon), invoking and honoring the principles of a different matrika (little mother) each night. For many, these are days of cleansing, fasting (generally one meal is eaten each day) prayer, and joyful celebration. The festivities take many different forms, from region to region. Goddess images vary as do the rituals. There are dances, fire ceremonies, mantras, decorations, and observances—every community in India joins the festivities in one form or another. According to Hindu Mythology, each matrika is related to a specific color, which is associated with certain attributes and invokes specific energies or states of mind. Each Goddess archetype offers an opportunity for introspection, contemplation…and growth! This season marks a time to start new ventures: businesses, relationships, and practices. On the first night of Chaitra Navratri, the goddess archetype, Shailputri (daugher of the mountain), is invoked for her patience—strength, courage, and centered composure. Also known as Sati, Bhavani, and Hemivati, Shailputri is associated with Mother Nature and the moon. Shailputri is also popularly known as Pārvatiī, the wife of Shiva and mother of Ganesha and Skanda. She rides Nandi, the bull, and carries a trident in her right hand; a lotus in her left. Stories of Shailputri advance a respect for the physical body and the Earth. She roots spiritual practice in daily life and restores value to the human experience. This is one of the most sacred colors in India. It represents fire, purification, and the quest for light—Awakening to higher awareness. Shailputri invites you to remember the sacredness in every day life and to incorporate mindfulness as a psycho-spiritual practice. How can I embrace spiritual practice as a more consistent aspect of my every-day life? Create a designated space, construct your altar, and commit to a daily meditation practice that includes mindfulness of your breath to cultivate patience and centered composure in all aspects of your life. On day two of the Shukla Paksha (waxing moon), goddess Brahmacharini is celebrated. She is the archetype of the ascetic. Walking barefoot, she carries a japa mala for meditation and a kamandalu (dry gourd for carrying water). She subsists on a diet of flowers, fruits, and leafy vegetables and sleeps on the earth. She is the unmarried avatar of Pārvatī, devoted to her practices of yoga and meditation. Invocation of Brahmacharini means committing to one’s own steadfast spiritual practice, as well as letting go of all excess. Because of her simplicity and purity, she is radiantly beautiful and reminds us that beauty comes from serenity within. White and Orange. White is the color of peace, purity, and asceticism. Considered, in India, to represent the absence of color, it is associated with un-attachment to the pleasures of the earthly human experience. On the other hand, it can be viewed as the canvas of infinite potential and spiritual awakening. Brahmacharini invites you to the deep wisdom of living life more simply. What can I release to simplify my life? Purge all excess! …from your closet, your cabinets, your shelves, your drawers, your refrigerator, your to-do list, your contacts, your desk, your life! Count the bags and boxes and let us celebrate the detox with you. Commit to at least one full day of digital detox per week. Goddess Chandraghanta is worshipped on the third night of the festivities. She is the form of the Goddess Pārvatī after she has married Shiva. Her name derives from the Chandra (moon) that adorns her hair. She rides on a tigress and is depicted with ten hands carrying both weapons of destruction and symbols of peace. Red indicates both sensuality and purity. In India red is the most common color worn by a bride. It also symbolizes fertility, prosperity, and the birth of a child. It invokes bravery, dynamism, and positive energy. Chandraghanta invites you to deeper levels of courage and compassion for yourself and others. How do I see my courage and compassion growing through my Eleven Moons journey? Commit to a weekly Tonglen practice. Whenever you recognize suffering in your self, or in the world, this meditation technique may become an automatic response for personal peace and healing. Enjoy an evening water bath ritual. Day four is all about Devi Kushmanda (the cosmic egg), who created the entire universe with the flash of her smile which is so bright that it removes all darkness from the universe. Her radiance is so powerful that she is said to reside within the center of the Sun—producing its energy and liberating its power for the benefit of the world. She rides a lioness and has eight hands. In her right hands, she holds a kamandala, dhanush, bada, and kamala (lotus). In her left she carries vial of amrita (nectar of immortality), japa mala, gada, and discus. Again, these symbols unite the principles of destruction with images of abundant life in a unified vision or the ongoing cycles of creation. Yellow/Gold and Red are the colors of the sun. In India, yellow is associated with happiness and learning, while red symbolizes grandeur and creative power. Kushmanda invites you to fully express your joy through radiant creativity. In what new ways would I like to express my creativity? Check in with yourself to see what creative endeavors you crave. Have you let go of a creative outlet or expression that once gave you enjoyment and satisfaction? Is there a new creative project that is calling for you to give it a try? Give it a try! Allow your radiance to shine through, without judgement. Engage a ritual to cleanse and nourish your eyes. Then practice tratak, candle-gazing. On the fifth day, Skandamātā is invoked for prosperity, treasures, and achievement. She is Pārvatī as the mother of Skanda, the god of war whom she adopted as an act of unconditional love. Skandamātā rides on a ferocious lion and has four arms. She carries lotus flowers, expresses the mudra of blessing, and holds baby Skanda in her lap. Sometimes she is seated on the lotus and is called Padmā. Pink is the color of comfort and nurturing. Green/blue symbolizes wealth and abundant nature. Skandamata invites you to realize the truth of your infinitely abundant heart. In what new way can I express my generosity and unconditional love? Turn inward for introspection. Is there a person, a group of people, a certain situation, or behavior that provokes your impatience or judgement—or simply seems difficult to love? Do a little research to find an organization that is seeking to educate, inspire, or awaken people to improve this situation. Then donate your time or money to help support the cause. You can even simply spread awareness. Allow this act of generosity to ignite feelings of abundance and well-being within you. Enjoy a bath ritual with rose water and milk. Devi Kātyāyani is worshipped on the sixth day of the Spring Navratri celebrations. She is the fierce, but beautiful, vision of the warrioress who comes forth to slay the demons of ignorance and limitation. Also called Chandika and Durga, she is considered one of the most violent forms of Goddess Pārvatī. She rides a lion and has four hands that hold a lotus flower, a sword, and the Abhaya and Varada mudras (courage and compassion). Her exploits are described in the Skanda Purana, the Devi-Bhagavata Purana and Devi Mahatmya. Her power is the combined power of all the Hindu gods. You can benefit from the qualities of Kātyāyanī by speaking a clear “yes” or “no” when you need to assert your intentions. When you fail to create strong boundaries in your relationships, you eventually get tired of the imbalanced dynamic. This turns into a fear of collaboration. You stop connecting. True freedom comes when you create loving, but strong and clear boundaries within your relationships. Begin this practice of discernment, so that you may benefit from the joy and efficiency of collaboration. Purple stands for spiritual freedom. It combines the calm stability of blue with the fierce energy of red. It is a color of both dignity and creative collaboration. Katyayani invites you to collaborate with clear, but loving, boundaries. Am I engaging my relationships in a meaningful and truly balanced way that includes both collaboration and freedom? What will be of most benefit to you and the other person in the long run? If your answer is “yes” it will be easy to respond without any hesitation. If your answer is “no,” use your courage and compassion to be completely honest. Another warrior goddess is invoked on day seven. This is the vision of Kalaratri whose dark skin represents the infinitude of the night sky (like the image of Kālī) and she is considered the most ferocious form of Pārvatī. As with Katyayani, her violence is channeled toward the defeat of demonic forces. An invocation of Kalaratri means inviting the complete cycle of creation, including letting go of old, outdated patterns, limiting stories, and useless information. When you face the wild image of Kalaratri, there may still be some resistance to her shadowy image. This is generally a reflection of the resistance you are holding toward your own shadows. The Eleven Moons journey invites you to lean more deeply into areas of resistance and to awaken to wholeness. All suppressed shadows become either self-defeating or self aggrandizing monsters. They often get projected onto outside “others.” In that space, there is no room for maitri—little opportunity for real, unconditional love or lasting peace. Kalaratri invites you to confront all suppressed shadows and limiting stories. Where are you still holding limiting stories about my life? What still scares you to confront? It is time to awaken to your infinite potential. It is time to break free. In the dark of night, turn off all the lights in your house. Sit until your eyes adjust. Just as the sun is always shining, recognize that even in the darkness, there is a light. There is nowhere you can go where the light will not eventually find you. That divine light is beyond all duality. It is the infinite potentiality of creative love. Rest in the darkness knowing that it is a vital aspect of the ongoing cycles of creation. Allow it to provide the quiet space for deep introspection that leads to psycho-spiritual awakening. Enjoy a hair or scalp ritual to release any emotional or environmental toxic buildup. Mahagauri invites you to realize your deepest desires with gratitude and activation. ​Contemplate your greatest desires. What three things make you feel the most healthy, happy, and fulfilled? Make a point to include some form of each of those things every. single. day. At the end of each day, say a prayer of gratitude for these blessings. Enjoy a marma point ritual and self massage for your face and neck. The last day of the Chaitra Navratri festival is celebrated in honor of Devi Siddhidātri. Sitting on a lotus, she is believed to possess and grant all type of siddhis, or mystic superpowers. She is Adi-Parashakti, the supreme Goddess of Power, who is considered to be the left half of Shiva in the great form of Ardhanarishvara (the hermaphrodite form of divinity, more on this in the moons ahead!). She is depicted with four hands, with a gada and discus in her right hands (weapons); and a lotus flower and conch shell in her left hands. She is often depicted sitting on a lotus throne. According to Hindu mythology, for instance in Markandeya Puranas, this incarnation of feminine divinity helps devotees attain joyful powers and purity of heart. Grey is the color of neutrality, sitting between black and white. It symbolizes the merging of all opposition. It represents the wisdom that comes from age and the attainment of peace within a chaotic world. Like the spacious creativity of the vast, cloudless sky, it invokes a feeling of happiness and calm. Consider how invulnerability, levity, super-strength, or even invisibility could be experienced, not as literal, but as psycho-spiritual states of awareness. What superpower would you like to realize within your Self? How is your practice helping you to realize that siddhi? Enjoy a closing ritual of bath, abhyanga, and meditation.